Every time I go to Tremblant, it’s always an enriching experience. There’s never a dull moment on this vast mountain where you can discover new trails and new spots with every visit. As soon as the Versant Soleil opens, I hit the countless winding slopes and start exploring the 96 trails on this immense mountain, a place that offers more secrets than you can ever uncover in one day. I’ve been skiing at Tremblant for over 10 years and I’ve never been disappointed. 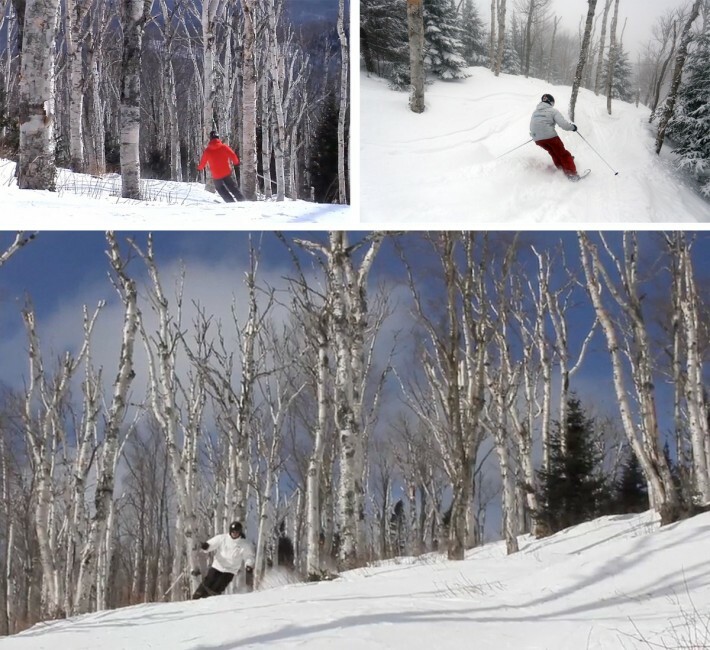 Whether at the start of the season or in the spring, each of us has a Tremblant favourite. Here are some of my favourite ways of exploring and making the most of my day on the mountain. Each versant, or hillside, has its unique characteristics. The Versant Nord generally has more snow and keeps it longer when the weather doesn’t cooperate. The Versant Soleil is the first side to melt but also the sunniest. The Versant Sud is the best compromise between the Nord and Soleil hillsides but is often the busiest. The Versant Edge is the most natural hillside, making you feel far away from the busy tourist scene. This wooded area can be accessed after the first steep slope on the Lowell-Thomas trail on the right. You need to maintain enough speed to make it up the small hill that leads to this area. The trail is like a narrow corridor within a forest. It’s a beautiful spot that often goes unnoticed or is forgotten because skiers tend to head off to the other side of the triple chairlift. 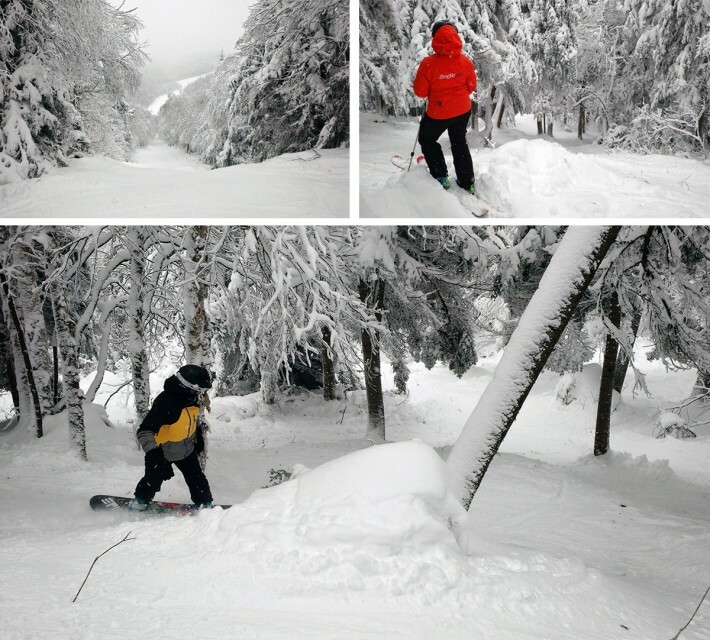 Aside from the main trail, there are newly opened runs in the glades. It’s a long and steep slope but you can exit the wooded area at any time to take a break on the main trail. The Les Bouleaux trail has a particular charm. It starts on the ridge that divides the Sud and Soleil hillsides. It’s about a 5 to 10-minute walk (go at your own pace!) to reach the head of the trail. Then the scenery changes into a very wide wooded area with lots of birch trees and a spectacular view. The trail can be accessed by the Ryan Haut (Versant Sud), at the junction of the Ryan Bas and Charron trails, and ends on the Laurentienne (Versant Soleil). Skiing on the Edge hillside is like skiing on a different mountain where nature plays a leading role, as opposed to the more “sculpted” trails made with artificial snow for which Tremblant is best known. This hillside is accessible via a fixed chairlift, whose slow speed deters many who don’t know what they’re missing out on! From the top of the hillside are two glade runs on either side: Émotion and Sensation, and their names speak for themselves. The central trail, Haute Tension, is very steep and I would only recommend it to skiers who aren’t afraid of jumping over a few ice-covered rock cliffs. My favourite trail here is the Sensation but the entire hillside is worth exploring, especially as it’s generally only open on weekends, accumulating snow throughout the week. These are my favourite and most-used trails at Tremblant. The Marie-Claude Asselin (Versant Nord) is a narrow trail that was formerly used as a T-bar lift. The CBC is a unique trail that takes you through a wooded, natural mogul area on the Versant Nord – a good test for your legs! The Erik Guay (Versant Sud) also has moguls that seem never ending, especially at the end of the day! It is, however, always well maintained and a very enjoyable run. Back on the Versant Nord, the Devil’s River trail is a must on fresh powder days; because of its location, the trail is sometimes overlooked and therefore gets worn down more slowly than the others. 5. Après-ski in the microbrewery? 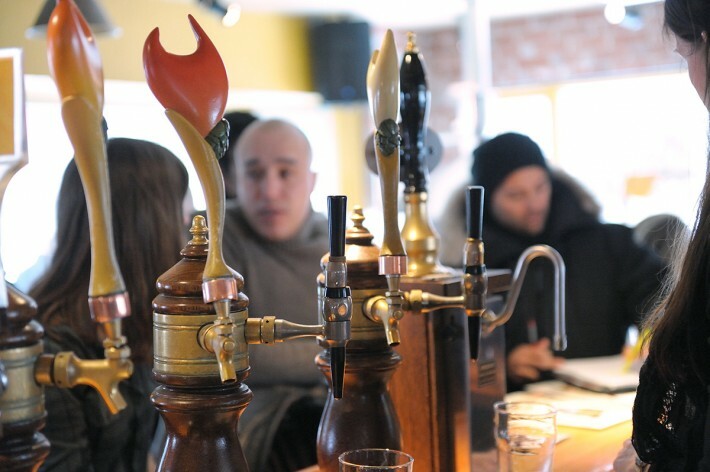 Whether for lunch, for après-ski or in the evening, the Microbrasserie La Diable is well worth the detour. With its “devilishly” fun atmosphere, this microbrewery offers the perfect setting to enjoy wheat, blond, amber or stout craft beer. La Diable also offers pub-style food to satisfy the appetites of skiers who have spent the day on the slopes. The sunny patio is a must in spring, particularly at lunchtime when you can relax a bit before returning to the Versant Sud for some spring skiing! This suggestion, which everyone agrees with, comes courtesy of our writer Pierre Pinsonnault! Thank you! You’re in one of the largest ski centres in Quebec . Everything is big here but well organized to make your life easier. 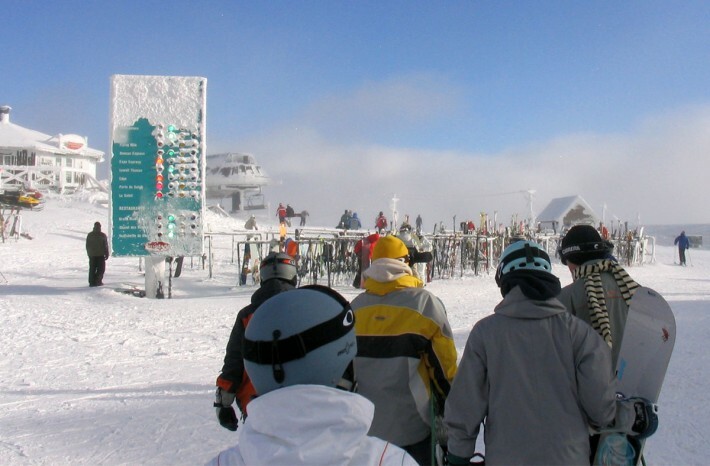 For instance, at the top of the mountain is an electronic board showing the average waiting time at each lift. It’s very useful to help you manage your day and avoid long lines! The Versant Nord is often a good way to avoid the crowds. Its parking lot makes it easier to access the mountain and its lodge is much less crowded at lunchtime. On the topic of lunch, consider eating before noon or after 1:30 pm. Often the lodge at the summit is by far the busiest spot, making it difficult to move around. Pick another place such as the Versant Nord or the base of the Versant Sud. Be creative: given the network of ski lifts, there’s usually more than one way of getting to the top. If the gondola on the Versant Sud is crowded, take a lift that goes halfway up the mountain then hop on another lift to get to the top. Or, walk a couple of minutes to the Casino gondola, which will take you up to the top of the Versant Soleil! These are “my” tips and favourite spots… but Tremblant also offers guide services: a friendly individual is always available at the top to answer your questions and give advice. Feel free to talk to them and perhaps even learn about some of “their” Tremblant favourites! This guided tour is part of “The insider’s guide ” series, created by ZoneSki writers. All articles are available on the series page. Originaly posted on ZoneSki.com on January 22nd 2015. This article is part of the series “Suivez le guide” created by the chroniclers of ZoneSki.